No – the beginnings of something! A massive hole was dug, the foundations have been poured, the metal supports are in place and Ekkehard is in Italy carving. He has started a blog to chart the progress of the work. 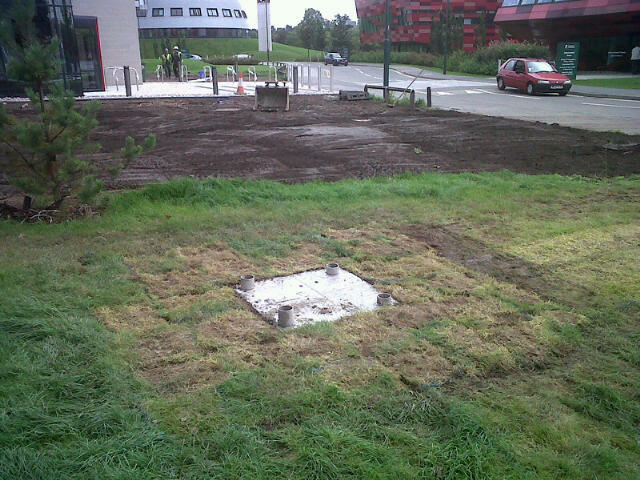 It’s hard to believe that this drab little bit of grass will soon host a 6 tonne marble sculpture. Since my last post pre-cutting of the ten tonne block of Carrara marble has been completed. There are 2 stages of cutting, one involves a straight cut with a wire diamond cutter, the second one uses a robotic arm that pre-cuts the shape based upon a further rendition of the sculpture design. 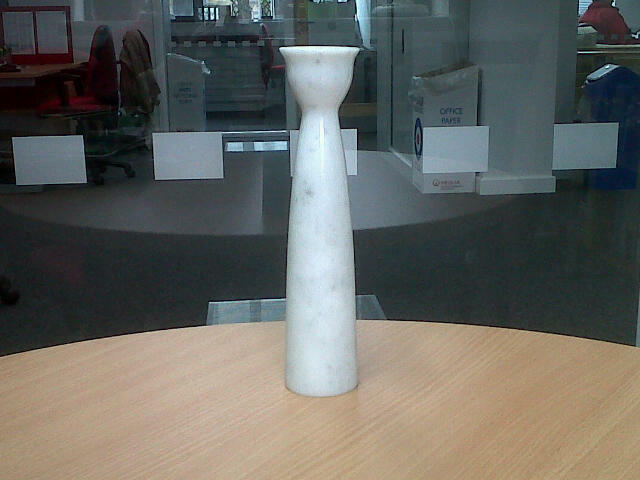 This model was 3D scanned and used for the pre-cutting in the Petacchi quarry. Ekkehard has since started the fine carving. The IMH Blog ~ 4,683 online visits from across 56 countries! It seems a while since I wrote on the IMH blog; life hasn’t stopped though by any means. It has been quite an adventure these last few weeks with a lovely cruise around France and Spain, a mini stroke, and lots of family stuff; I feel I could go on forever. However, working life at the NIHR Mental Health Research Network, here at the IMH, hasn’t stopped either. I am working hard with colleagues to establish a new Research Group in the North of Nottinghamshire at the Rosewood Involvement centre. Our first meeting is on the 22nd of October 2012. Although, working in the North of Notts. seems a million miles away for me, as I don’t drive and the only way I know how to get up there takes the longest time in the history of the world. (Not really, it just feels like a long travelling time). Nevertheless, it promises to be an exciting new research venture. Let me see what else we have been doing here at the IMH MHRN. Well, we still hold our monthly patient and public Involvement group for those of you involved in research, as we are a group of service users and carers who wish to be further involved in the research process. We have many varied skills and are willing to help in any way we can. In addition, we look for individuals or teams to come and talk to the group about their research, as we can answer most questions regarding service user and carer involvement. Last week saw us completing registration of our group members with the Involvement department and this will aid us in our ability to participate in the ‘nitty-gritty’ finer aspects of research. Furthermore, the group met last week and discussed Industry-based research studies and also agreed to look at writing a bid to our co-ordinating centre to establish a checking system for research ethics of such Industry studies. Have yet to speak to them about how this will work, but at least it would be something to aim for. Can I just ask if anyone would like to join our group please? Or would like to ask the group about a project they wish to undertake? If so, please contact me and we can arrange for you to attend one of our groups. I am currently looking at speakers for next year and would be happy to accommodate those of you who are interested in either attending as a group member of as an individual speaker. Thanks. Take care for now, Debbie. Recent conferences, Q&A of paper presentations, and even my NHS REC meeting have recently made me question the impact of social research within mental health and the ‘so what?’ factor of non-clinical studies. We live and work in an evidence-based system whereby the expectation is that results are observable, measurable, quantifiable and replicable. Hence studies that value the lived experience of participants, and look for meaning rather than outcomes, can struggle to maintain a sense of validity and reliability within mental health research. However, there is much that value-based research can offer. As Larsen (2007) points out, evidenced-based studies that examine therapeutic intervention has a propensity to create the “black box” effect. The research may show whether outcomes have been achieved, but it cannot address exactly how they were met. Furthermore, these studies cannot say why these outcomes matter and who they matter to. This omission is fairly significant given the discrepancies between provider and patient expectations. Gilburt, Rose and Slade (2008:8) argue that ‘[d]ivisions in the views of patients and professionals in terms of what variables and themes are important mean that the resulting studies may be a poor representation of the user perspective’. Furthermore, evidence-based research ignores personal agency and creativity as it requires that support be routinised according to a set of rational mechanisms that are universally applied (Haigh, 2005). From this perspective, individuals need only respond to a prescribed agenda of recovery rather than find meaning from their own unique experiences (Rose, 1999). Thus in order to avoid prioritising “what works” over “what matters” (Haigh, 2005), we need studies that emphasise participants’ experiences of mental health and the outcomes that are important to them. But there is an even greater ‘so what?’ question that value-based researchers within mental health must address. Even if we can convince our audiences that value-based research is meaningful and needed, what do we actually do with it? The conclusion section of many journal articles advocating the prioritisation of participant experiences usually end by saying something along the lines of, “the evidence-base should be expanded”, and/or, “what matters to participants should inform clinical practice and guide policy making”. Whilst I wholeheartedly agree, I also cannot help but notice that they do not offer any suggestions on how to do this. Given the evidence-based system that relies on outcomes that are deemed to be achievable and measurable, the direct impact of value-based research is not always obvious. However it is well worth considering the practical implications of how exploring participant perspectives and highlighting lived experiences can have a real-world impact within mental health. Gilburt, H., Rose, D. and Slade, M. (2008) The Importance of relationships in mental health care: a qualitative study of service users’ experiences of psychiatric hospital admission in the UK. BMC Health Services Research 8(92). Available online: http://www.biomedcentral.com/1472-6963/8/92. Haigh, R. (2005) The Trouble with Modernisation: we need better relationships, not policies and procedures. Mental Health Review Journal 10(3): pp.3-7. Larsen, J.A. (2007) Understanding a Complex Intervention: Person-centred ethnography in early psychosis. Journal of Mental Health 16(3): pp.333-345. Rose, N. (1999) Governing the Soul: the shaping of the private self. London: Free Association Books. 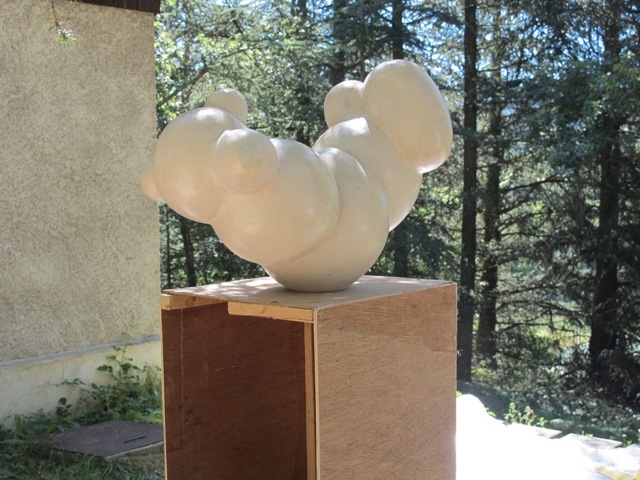 In this post Melanie Jordan from the IMH introduces two contemporary art ventures with mental health themes that may perhaps be of interest to IMH members. A BBC News photography article and a Nottingham Contemporary exhibit and talk. In this ‘BBC News In Pictures’ article Picturing Mental Health published on September the 12th (http://www.bbc.co.uk/news/in-pictures-19555676) Phil Coomes explores mental health via the work of photographers Marwah Al-Mugait and Michael McGuinness. It is noted this subject is ‘notoriously difficult to photograph without resorting to cliché and intrusion’, nevertheless ‘photography can be a tool to discover and an extra sensory experience’. Bipoloar disorder is explored via compelling pictures by Marwah Al-Mugait alongside discussion of intrusion and the notions of trust, understanding, and collaborative work with patients. The role of Birmingham and Solihull Mental Health Foundation Trust is then documented by Michael McGuinness. ‘Having been granted access Michael immersed himself in the Trust’s work and the subject of mental health.’ Many weeks were spent working with the Trust. The work tackles issues of stigma and captures the lives of staff and service users. This article and its photographs are available online:http://www.bbc.co.uk/news/in-pictures-19555676. A (free) talk by art historian and curator Gemma Blackshaw, who will discuss the work of Kubin in light of the ‘Madness & Modernity’ exhibition she curated at the Wellcome Collection (London, 2009) and the Wien Museum (Vienna, 2010). Book online: http://nottinghamcontemporary.org/event/gemma-blackshaw. ‘Haunting drawings of death, trauma and fantastical creatures inhabiting imaginary worlds sprung from Alfred Kubin’s pen at the beginning of the 20th century … Kubin never recovered from a deeply troubled childhood, losing his mother at a young age. Following a failed suicide attempt at the age of nineteen and a complete nervous breakdown at twenty, Kubin was sent to Munich to study at the art academy. This was where he finally found an outlet’ (http://nottinghamcontemporary.org/art/alfred-kubin). This week we have a reblog from Lucy Series, who writes a really excellent blog here. You can read the post in it’s original format here. 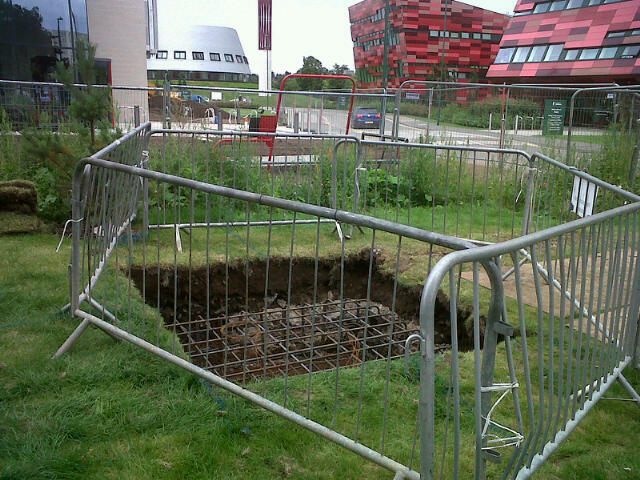 In the wake of Winterbourne View we are all looking for answers to the questions: How did this happen? How can we prevent it from happening again? There are as many different answers to this question as there are different responders. But there are difficulties with any one size fits all answer. It’s easy to blame it on the regulatory model, but as the Serious Case Review (SCR) showed CQC was one agency among many which failed to respond adequately to whistleblower allegations. We could blame it on the model of care, and it was a vile model of care – storage, not support, as Neil Crowther put it. But abuse happens in community based care homes and supported living settings as well. Another pattern, which I want to discuss today, is to blame it on the privatisation of health and social care services. When I attended a BIHR run event on human rights in healthcare in 2010, Nigel Thompson – head of human rights and equality at CQC – expressed concern that large care providers could undermine the diversity offered by micro-providers, and questioned how CQC could protect that diversity. I don’t know that any answers are forthcoming yet. Last year the National Development Team for Inclusion (NDTi) produced a fantastic report examining the root causes of why large, expensive private sector hospitals for people with learning disabilities continue to exist, when they secure such poor outcomes and are a discredited model of care. The answer in one word: capitalism. Most private providers are financed by debt. Banks must be satisfied that services are financially viable. Hospitals are easy to conceptualise with ‘safe predictions of profit’, whereas ‘alternative service models more in line with the Mansell Report …consisting of preventative services, sessional input and flexible contracts for support …are more complex to cost and predict.’ Consequently, ‘At a time when banks are less willing to lend, and are looking for greater security from companies, a move towards untried (in business terms) models that have no recognised framework for costing and predicting profitability will be attractive to neither the provider nor the bank.’ The report concluded that only with concerted state action could services in line with the Mansell report be developed. In essence, although the ideals underpinning the privatisation of care turned in no small part on freedom of choice, this turned out not to suit providers all too well as they suffered the resultant market instabilities. That market failure might be a bigger problem in care than, say, discontinuing a line of baked beans, was evident from the panic that ensued when Southern Cross was folding, and nobody was sure week on week who – if anyone – would be supporting residents of Southern Cross care homes. People with severe disabilities, such as those at Winterbourne View, would have previously been cared for in large NHS asylums. However, in the Nineties, with the widespread closure of these, the residents were moved out and cared for by the NHS in the community. While some were able to live independently with NHS mental health service input, some were too disabled and required 24-hour care. These people fell awkwardly between the criteria for NHS care and for personal care, and ultimately their welfare was placed in the hands of social services, despite them having severe and complex medical problems. Legislation such as the 1990 National Health Service and Community Care Act, as well as the Supporting People initiative, enabled private agencies to develop and provide specialised housing. The result of this is that too many people with severe and complex needs, who were once looked after by medical staff in institutions, are now at the mercy of unqualified staff in the private sector. The issue is not just that there is abuse taking place in some of these homes, but that the level of care that residents receive in all of these homes is substandard because the staff are not medically qualified or trained to the standard expected on NHS wards. There is no place for specialist hospitals in the care of people with learning disabilities (outside of serious forensic issues). There is clear evidence that such hospitals provide poor outcomes, often at very high cost, and that there are better, alternative ways of supporting people that have behaviour labelled as ‘challenging’. There is a place for a small number of local assessment and treatment beds, integrated with other local community services. These charities aren’t arguing for people to be moved into NHS run hospitals, they’re arguing for people to be moved out of healthcare services altogether – into community services. To be fair to Pemberton, however, he does argue ‘I wouldn’t advocate returning to the days of large institutions and asylums’, but he does seem to be advocating for care services run on a healthcare model. Secondly, it seems to be linking the abuse at Winterbourne View to the fact the services were not run by the state. I’m probably going to lose a few friends by what I’m going to write next, but I think it’s problematic to argue that the state always provides better services. I don’t mean to come over all Philip Blonde about this, but the fact is that there are many excellent and innovative forms of care that are being developed – with (hopefully) support from local authorities and the state – in the independent sector. For example, most micro-providers – which can have excellent outcomes – are in the independent sector (see Community Catalysts); Shared Lives schemes can have excellent outcomes, and they can also be in the independent sector (although some are run by local authorities). Pemberton’s article sent me scurrying away to look up some research I did in the twilight days of the CQC using care standards ratings. Using their old search engine (have I whinged yet about how much better it was than their new search engine? ), you were able to search for the number of registered providers of different types of care (e.g. 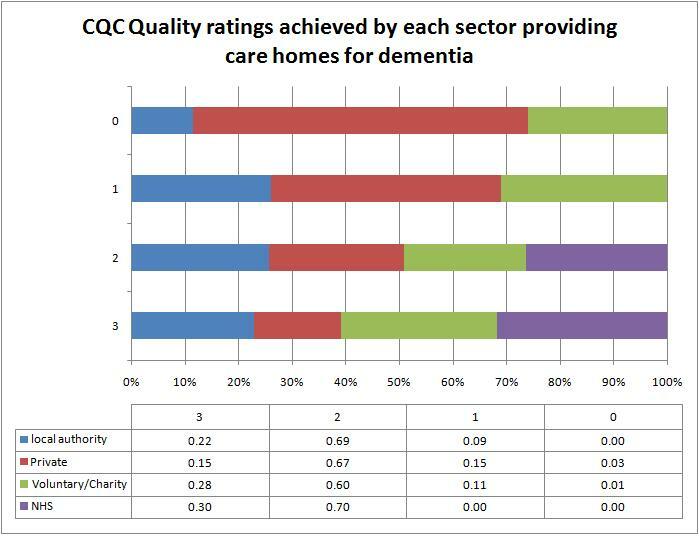 care homes, domicilliary care), of different target users (e.g. learning disabilities, ‘old age’, dementia, etc), and of different provider type (e.g. voluntary sector, private sector, council run, NHS). Now, CQC did release some data back in 2011 which showed that council care was better than private sector care, but the data I unpicked showed a slightly more complex picture. For each type of service provider (e.g. 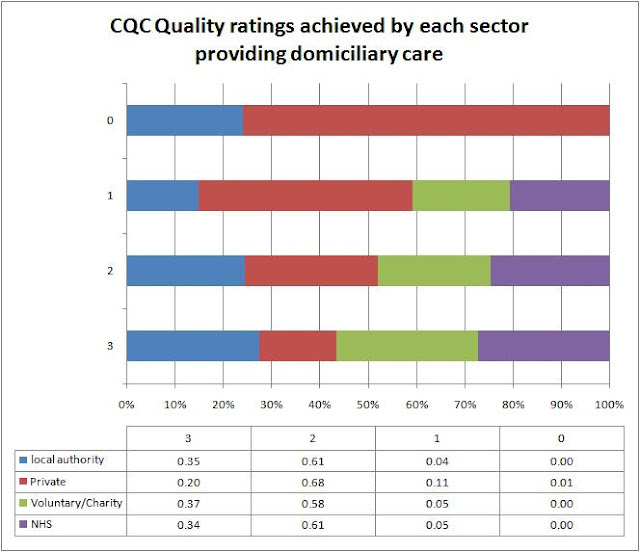 NHS, local authority, voluntary/charity or private – meaning ‘for profit’) I calculated the proportion of services receiving CQC ratings of 0 (poor), 1 (adequate), 2 (good) or 3 (excellent). I broke this down by type of care being provided. I also looked at the proportion of services offered by each type of provider. The charts below reflect what I found. These data were collected in April 2010. I have shared a copy of the spreadsheet with the data in full here, which you are very welcome to use as you see fit although please note the Creative Commons license this blog is published under. I apologise that the graphs don’t quite fit on the page, but it’s probably better to be able to read the text than look pretty! The largest proportion of domiciliary care is provided by for-profit (‘private’) providers, followed by local authority, then voluntary/charity, and then a small proportion of NHS providers. Of those providers, the private sector has the largest proportion of services rated ‘poor’, followed by the local authority (note: not the independent sector). 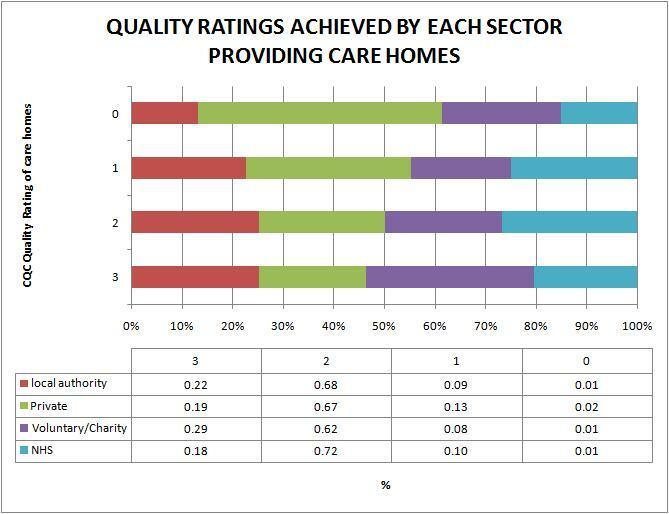 The Voluntary sector had the highest proportion of its services rated ‘excellent’, followed by the local authority, then the NHS, with the private (‘for profit’) sector having the smallest proportion of its services rated ‘excellent’. 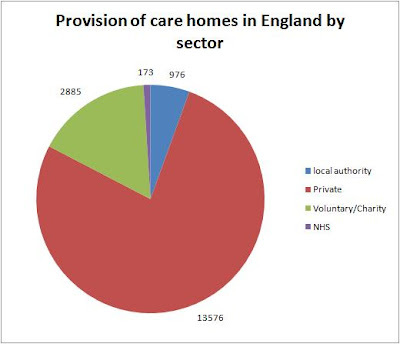 As with domiciliary care, the private sector provides the largest proportion of care homes, followed by the voluntary/charity sector, then local authorities, then the NHS. 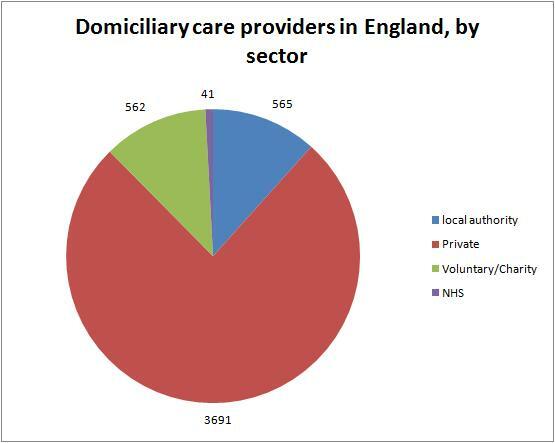 As with domiciliary care, the private sector has the largest proportion of its services rated ‘poor’, followed by the voluntary sector, then the NHS, then the local authority. 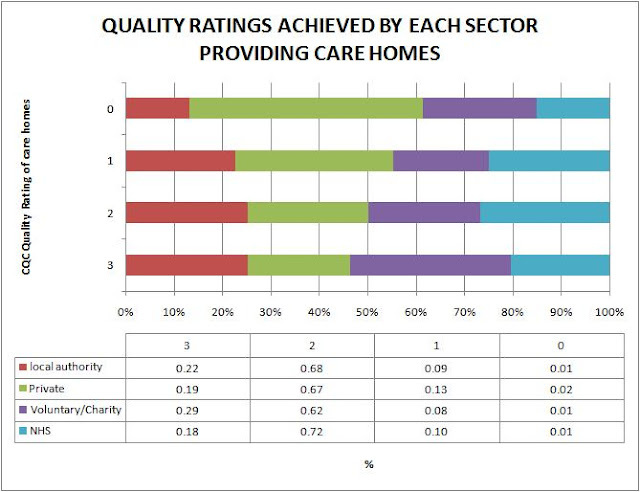 However – contra Pemberton’s cheerleading for the NHS – the NHS also has the smallest proportion of care homes rated ‘excellent’, closely followed by the private sector, then the local authority, with the voluntary/charity sector providing the largest proportion of care homes rated ‘excellent’. This pattern changes, however, if we break down care homes by the type of user. For care homes for old age, the private sector has the largest proportion of ‘poor’ services, followed by the voluntary/charity sector and then the local authority. The NHS offered the highest proportion of ‘excellent’ care homes for old age, followed by the voluntary/charity sector, then the local authority, then the private sector. 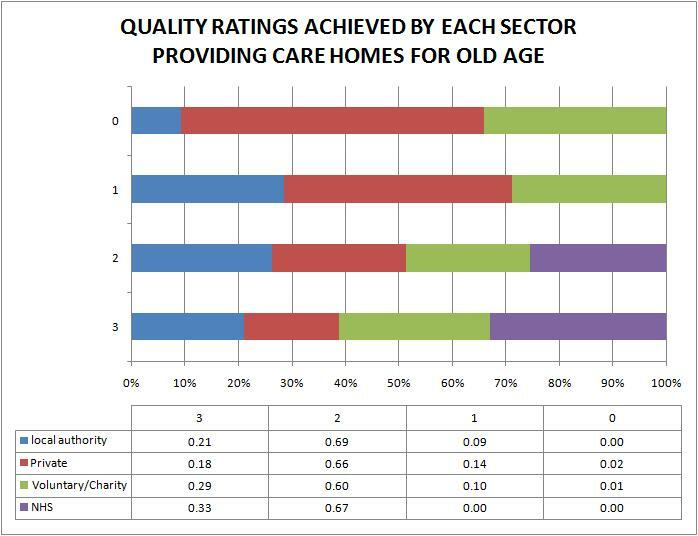 But before we get too excited about the NHS offering no poor or adequate services and the largest proportion of ‘excellent’ services, note that there were only 3 NHS run care homes catering for ‘old age’ in this sample. For dementia, again we see that the private sector has the largest proportion of ‘poor’ services, followed by voluntary/charity then the local authority. The voluntary/charity sector offers the largest proportion of ‘excellent’ services, followed by the NHS, followed by local authorities with the private sector coming last. Once again, however, the NHS data should be treated with caution as it only reflects a sample size of 10. For adults with learning disabilities, the private sector had the largest proportion of ‘poor’ services, and the local authority the least. 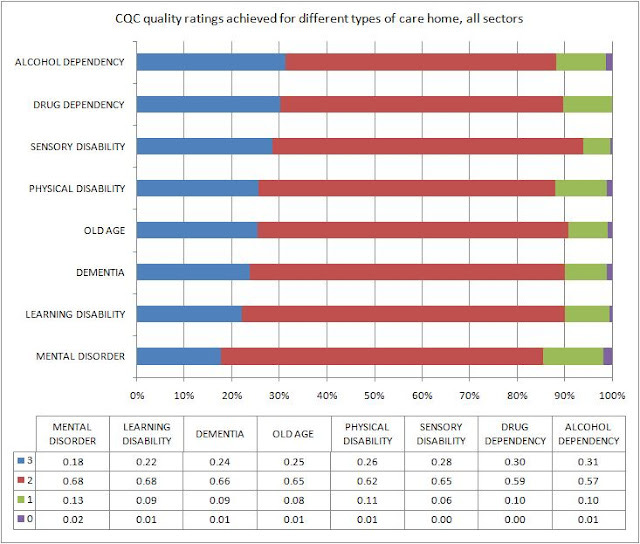 The voluntary/charity sector offered the highest proportion of ‘excellent’ services, followed by the local authority, followed by the private sector – with the NHS offering the smallest proportion of ‘excellent’ care homes for people with learning disabilities (there were 157 NHS care homes for this sample). 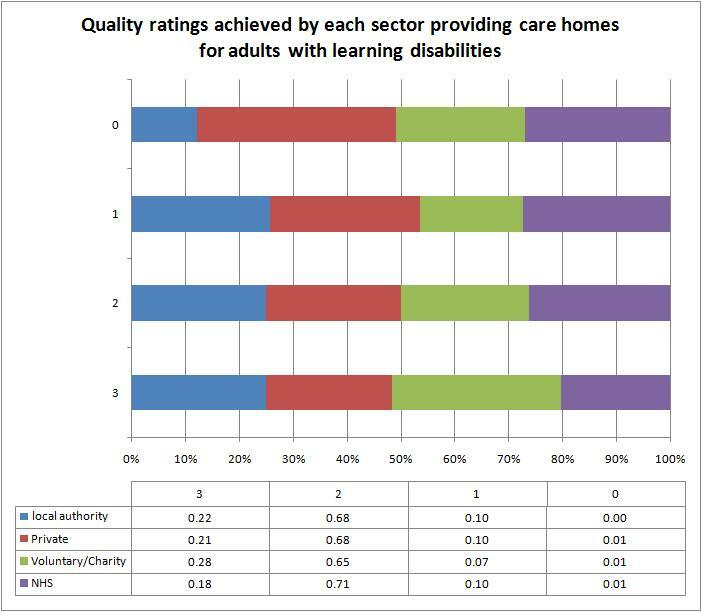 The NHS did offer the highest proportion of ‘good’ care homes for adults with learning disabilities, but in terms of services rated higher than ‘adequate’ it only equalled the private sector and was outcompeted by both the voluntary/charity sector and the local authority services. 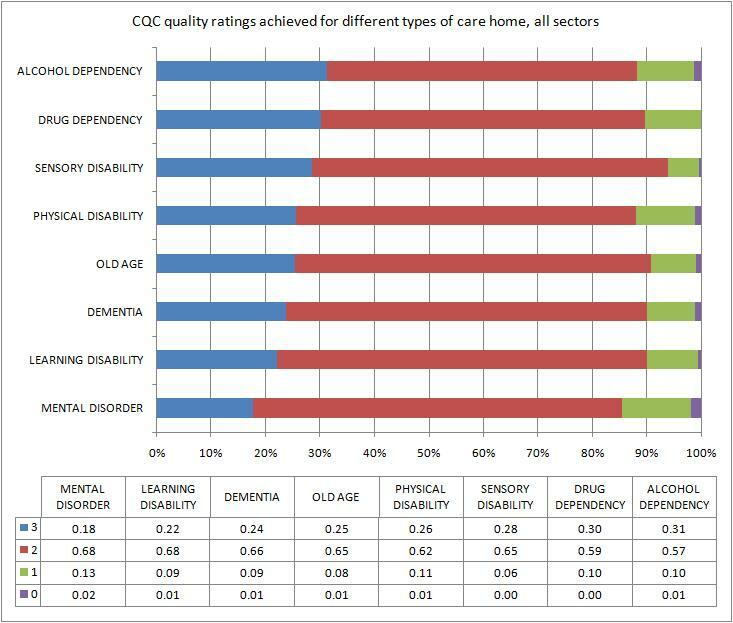 This last chart is not related to the type of provider, but does facilitate comparisons between how good different types of care homes are for different types of users. These data are two years out of date now, but they do suggest that it is not an easy generalisation to make that the state offers better quality care than the independent sector. Digging deeper into the data, there are many occasions when the voluntary/charity sector performs better, and – for care homes for adults with learning disabilities at least – the NHS doesn’t seem to excel. It might stick in your throat to acknowledge this, but the voluntary/charity sector would not be offering these kinds of care services were it not for the ‘privatisation’ of social care which allowed services to be commissioned from independent providers. One pattern does stand out in these data though, that the for-profit private sector, which holds the largest share of the market, is consistently the worst. It offers the most poor services, and the fewest excellent services. The state isn’t always better, but profit usually makes it worse.